SOUTH YARMOUTH, Mass. – As David Robertson’s (Alabama) last pitch crossed the plate for strike three in the final game of the CCBL Championship Series, untouched by the swinging bat of Wareham’s Bradley Suttle, the fans at Red Wilson Field knew something special had just transpired before their eyes. When a team as talented as the 2006 Yarmouth-Dennis Red Sox wins a championship, it’s easy to overlook the individual performances that made the team so great. Robertson’s postseason pitching, however, was too good to go unnoticed. Before the team was awarded the championship trophy, league commissioner Paul Galop presented Robertson with the ESPN SportsTicker Playoffs MVP award. To earn the award, Robertson made four appearances in the postseason, collecting a save in all four of Y-D’s wins. In 15 innings, Robertson struck out 15 batters, leading all pitchers in both categories for the postseason. He didn’t relinquish a single run in any of his saves; in fact, he didn’t allow a single man on base. 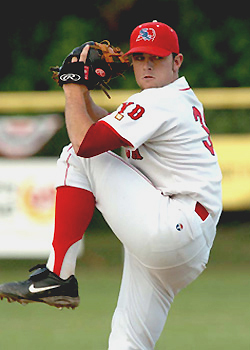 His best performance came in the third game of the championship series against Wareham. Teammate Terry Doyle (Boston College) pitched six innings and exited with a 5-1 lead, leaving the game in Robertson’s hands. In the seventh inning, Robertson struck out one batter and got the other two outs on ground balls, but he was only warming up for the really impressive innings. In the eighth and ninth innings, Robertson faced only six batters and struck out all six of them for a total of seven K’s in the game. Robertson was happy to win the award but even more pleased that he was able to help his team win its second championship in just three years. “It feels great doing what I can to help my team,” Robertson said in between signing autographs for eager young fans after the clinching game. Robertson’s playoff performance will more than likely just be an early chapter in this young pitcher’s book, as everyone agrees that Robertson is a special young man. “The kid’s nasty. He’s got a bright future ahead of him,” Red Sox general manager Jim Martin said while soaking up the scene at Red Wilson after his team won the championship – thanks in large part to this great pitcher.